Deciding on an extended warranty that’s right for you can seem daunting, especially when reading a contract feels like decoding hieroglyphics. Unfortunately, understanding the fine print and verbiage is key to choosing coverage that’s going to be there when you need it most. Don’t worry – we’ve got you covered with our three-part blog series: “Decoding your RV Warranty”. This series will give you the in’s and out’s of extended service contracts. To get started, we’ve broken down some basic terms of an extended warranty so you can feel confident when analyzing different contracts and deciding what’s best for you. We’ll start with the first and most basic definition: RV Warranty. 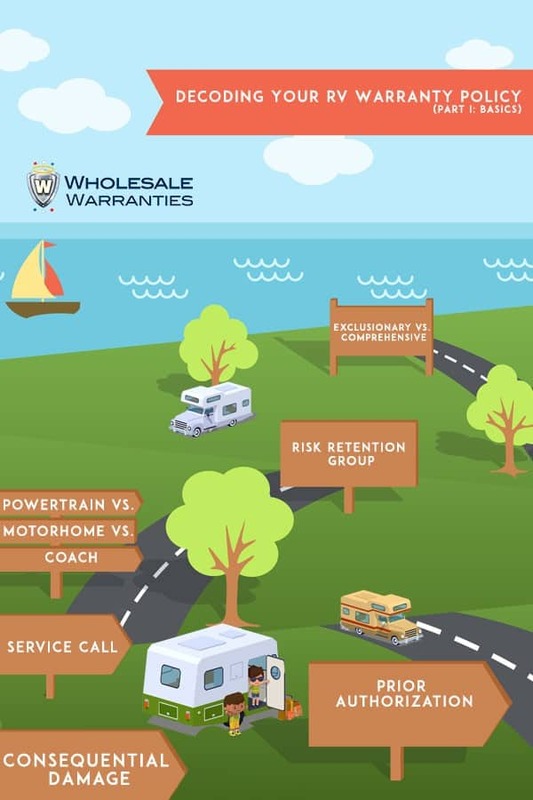 What is most often referred to as an RV extended warranty is actually an RV extended service contract, as these contracts are not affiliated with a coach’s original manufacturer warranty. That being said, the terms are used interchangeably within the RV community and industry, so we will use both throughout this series. An ‘exclusionary‘ policy can seem counter intuitive, as it doesn’t sound like the most comprehensive kind of coverage. However, if your policy is an exclusionary one, it is actually the highest level of coverage offered. Every mechanical component will be covered, except for those items specifically listed under the “What is Not Covered” or exclusions section of the policy, hence the title “Exclusionary” coverage. Most contracts will offer a ‘comprehensive‘ or “listed component” level of coverage as well. This type of policy will list exactly which items will be covered by the contract. If the failure you experience is not on this list, it will not be covered. This is a lower level of coverage than the “exclusionary” policy defined above. A Risk Retention Group (RRG) is an RV warranty provider that is not eligible to be backed by an Insurance Company or Guaranty Fund. This means, if they do not have the appropriate funds – your claims may not be paid. If the RRG goes out of business, no company is held responsible to pay claims, even if you have time remaining on a contract you have paid in full for. It’s important to ensure your extended service contract is backed by a large and financially stable insurance company. A “Fully-Insured” RV Warranty company must meet strict guidelines to be backed by an insurance provider. If a warranty company states it’s fully-insured, be sure to check the stability of the insurance provider backing them. The powertrain refers to the engine, transmission, and axle of the vehicle only. Motorhome is the entire recreational vehicle. Coach indicates the living space of the recreational vehicle. The term ‘service call’ applies to the additional fee a ‘mobile mechanic’ will charge for traveling to you for repairs. Many extended RV warranty providers will require you to take your vehicle to a sticks-and-bricks service center. Some may allow for mobile mechanics, but will only pay for the service call cost in the event your breakdown renders the vehicle immobile, such as a slide-out that will not come in or a leveling system issue. If you are a full-timer or frequent traveler who will be on the road often, it’s important to ensure your policy will allow you to take your vehicle to any approved repair facility, including mobile mechanics. Every claim, no matter the warranty provider, must have a work authorization number from the administrator before the repair facility can begin work on the recreational vehicle. Preauthorization will be the difference between a claim being processed smoothly, and getting denied entirely. When purchasing a policy you may want to look for an emergency claim clause. This contract verbiage allows for repairs without authorization in the case of absolute necessity outside of regular business hours. When the language states ‘consequential damage’, it is referring to damage to a covered part that is caused by the action or inaction of a non-covered part. Consequential Damage failures are excluded by every contract, but certain providers may offer an additional coverage option that, when purchased, would allow for these types of claims to be approved. 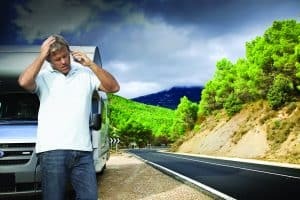 Other optional coverages you may consider are RV Roadside Assistance and RV Tire and Wheel Protection, saving you time and money in the event of a breakdown. Although it can be complicated, understanding the basics of your extended warranty is the first step towards obtaining peace of mind coverage. In Part II we’ll dive deeper into repair costs, and how to discern if you’re getting a fair price on parts and labor.